Gifts from the Pirates: "Get a bunch of bad guys together to fight bad guys? That's a terrible idea!" "Get a bunch of bad guys together to fight bad guys? That's a terrible idea!" I've been pretty quiet on here for the last few weeks but there has been a good reason for it. When we asked Opeie what he would like for his birthday, we were obviously expecting some sort of LEGO, he's a HUGE brick enthusiast just like his dad. What I wasn't expecting though was for him to ask for something that you can't buy as a kit. 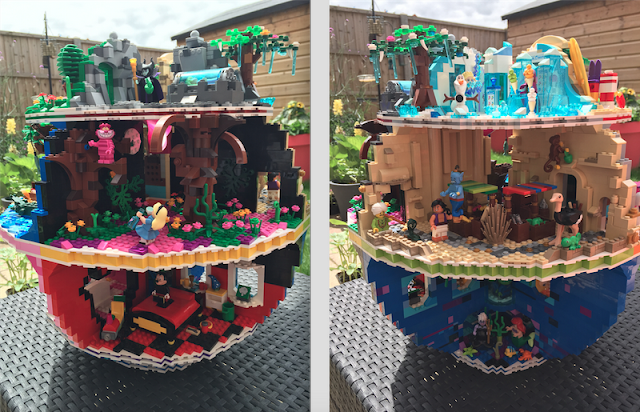 When it comes to Opeie's LEGO roleplaying, the most played with LEGO piece is the Disney themed Deathstar that we built last year. The shape of the original kit has the best playability for children and with all those rooms to play in with your minifigures, it is amazing for making upLEGO stories. The Disney themed one came about after creating our Christmas themed Deathstar the year before. 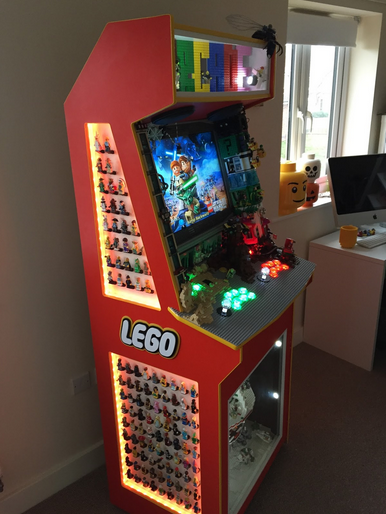 The boys loved it but it ended up becoming part of our LEGO arcade machine. We encased it in the lower part of the machine for display meaning that the boys couldn't play with it anymore (as you can imagine they were not impressed). The Disney Deathstar made up for that though, that was until the release of The LEGO Batman movie. 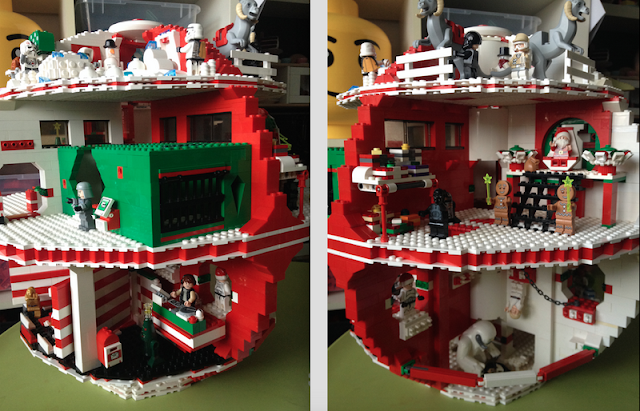 Opeie has become a huge DC fan since watching the movie, so when it got to his birthday build up, you can probably guess what he asked for, a Batman-themed version of his favourite play set, the Deathstar. We talked about it and I said maybe it could be something we could build together at a later date because there was so little time before his big day (yes I'm a meanie!). After that it was all systems go, I had 3 weeks to build it but it took almost a week for some obscure shaped baseplates to be delivered that I needed to build the levels. I spent the first week hitting all the online trade sites as I had a list as long as my arm of characters needed to fill the creation and I wanted to keep costs to a minimum. Bless Opeie, as part of his request there were only 2 characters he asked for that he really wanted, but I was sure I could do better than that though. As soon as my Bricklink order arrived I began building, For the first few days I went through my usual self-doubt 'this is going to turn out crap' 'I haven't got enough time' blah blah blah. As always though when I am building, the more bricks I attach the more motivated I get and my race to complete this special gift for that awesome boy of mine became a very fun challenge. Each night he would go to bed and as Mrs M was tucking him in, I was sneaking my creation downstairs to continue building. There were packages coming pretty much every day from figures I was trading and it was shaping up to be a creation full of DC Comics finest. In keeping with the randomness of the movie and the awesome kits released to coincide with the movie, I didn't want to be too obvious with the themes of the rooms. We had already created custom jokers fun houses on different occasions and Mr Freeze and Catwoman have had their own builds on various things. The only character I repeated was Poison ivy but that was only because I had stolen the monster plant from Opeie's Scooby Doo kit for the arcade and hadn't replaced it. He wouldn't let me forget it so I saw it as the perfect chance to build him a new one. Instead of The Joker getting his own multicoloured craziness of a room I decided to base their room around Harley Quinns nurse outfit from the LEGO Batman series figures. Joker donned some scrubs and poor Batman lay in bed completely oblivious about the medical care he was about to receive. The two characters that Opeie really wanted were Beast boy and Star Fire. He has become quite the Teen titans Go! fan since his new found DC obsession, so seeing as we already had Cyborg and Robin it made sense to track down the others and create a Teen Titans Go! room. All I needed to fill it was a pink couch from the episodes and the characters, job done. With the latest wave of Mighty Micro's hitting the shelves, we were very lucky to have had them sent to us to review, so we had a great collection of them to use in the build. as they are shorter than the usual characters and have cute child-like facial expressions Opeie had joked about how it would be cool if they were all in a class room. I had seen this done already but I wanted to include it in the build and using Eraser and Calculator as the teachers was a nice touch I think (I still want to get hold of Calander man too though). Lobster Lovin' batman and Vacation Batman were two of my favourite characters from the Movie series figures and I wanted to do something fun with them both. I had built a bat shaped pool when the series was released and I was hoping to use that, but it was far too big for the Deathstar, so I used half of it in one of the larger rooms for Vacation batman, Aquaman, Orca and Black Manta and then for the remainder of the room built a sauna for Lobster Lovin' Batman. As the Minifigure packages were coming through the post each day, I was building up quite a collection of Batman variations in different outfits and figured that the only way to display them was to create a walk in wardrobe style room for the Dark Knight himself. I loved this room because the brighter costumes really added some fun to what had been a build heavy on the black and grey. I had also managed to get hold of a lot more villains than I was expecting and obviously not all of them were going to get their own themed room. I needed somewhere to put them so I decided to add in Gotham police station. Barbara and Commissioner Gordon got there own room and after mooching for all the handcuffs I could find I had a great place to display some of the bad guys that just couldn't help but get captured by Batman and Gotham PD. One thing I was really thankful of while building this was that we had won a Mosiac from the Opening of the Leicester square store which was so awesome. After Opeie had built the custom portrait of his face there were loads of single studs left, which ended up being perfect for making patterned flooring in many of the rooms. By this point, I was really running out of time and I had so many other things that I needed to be doing in preparation for Opeie's big day. Then Mrs M pointed out something that stupidly hadn't even crossed my mind. I get so carried away when I am building something that all I can see is the end piece, she pointed out though that although it was turning out great and clearly he was going to love it, wouldn't it be nice if some of it was left for us to build together, and she was so right. Whenever Mrs M asks if there is anything I would like for Fathers day or my Birthday, I always say 'something fun I can do with the boys' and I almost missed out on the magic of building LEGO with the boys here. So I left the lower section of the Batcave for Opeie to build a Batcave area for batman and Robin and the top floor empty, no walls or flooring etc. I simply wrote 'Happy Birthday Opeie' in bricks and displayed the remainder of the figures that I managed to collect over the weeks. As expected the Batman themed Deathstar went down a treat and having that area on top to sit and build together really was an amazing idea of Mrs M's. Opeie has big ideas and we've just started building a pizza parlour for his new Scarecrow figure from the movie set. He's also been busy making sports related Batman costumes for his costume room. It's going to be a fun few weeks of custom building with the boys and I'm looking forward to getting stuck in with them. I can't wait to see what craziness the boys come up with. LEGO will continue to be one of my favourite things to do with the boys, there really is so much father/son magic in those amazing bricks.